Every other Sunday, Leonard’s Shoe Repairs and Dry Cleaners, 22 Chapel Market, Islington, undergoes a transformation. 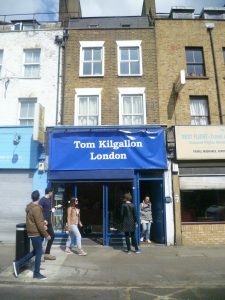 A banner appears over the shop fascia board saying TOM KILGALLON LONDON. Inside, the counter has disappeared, and the shop has turned into a high end Pop Up shoe shop. 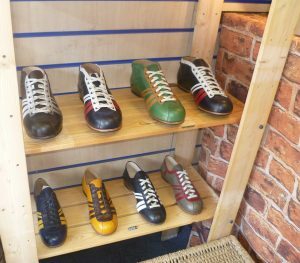 To the left, there’s a display of ZEHA BERLIN hand-made sports-inspired casual shoes, based on the traditional football shoe, ranging from £200-£225. Not only are they beautiful to behold, they are designed for both men and women, and are incredibly comfortable. There are subtle differences between the shoes; Club are low cut round the heel; Libero and Liga are padded round the heels and the designs of the lace guard differ; and the Derby boot has a higher heel and is more supportive. While I was there, I met the elegant Florence, a Three-D designer, who came in to see what was new in the Pop-Up shop. She walked out wearing a blue, white and tan pair of the Zeha Berlin shoes which looked terrific. ‘They will go with everything,’ she said happily. 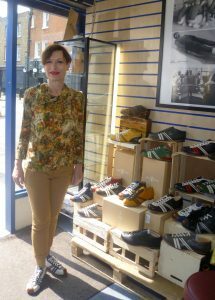 The elegant Florence in her new Zeha Berlin shoes. And she’s right. 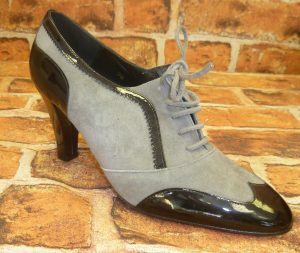 Apart from with a ball dress, I couldn’t think of an occasion where the shoes wouldn’t look just great. 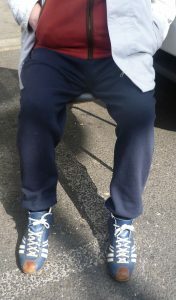 Outside, one of the stallholders was sitting in the spring sunshine. He, too, was wearing a pair of Zeha Berlin shoes. He allowed me to photograph his feet. I asked him for his comments. ‘Beautiful,’ he said, stretching out a foot towards me. ‘Feel! Soft as mutton. I’d recommend them to anyone.’ His shoes are obviously well-loved. 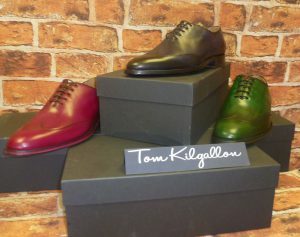 Tom Kilgallon’s own hand-made shoes are on the right. They are specially designed in limited editions of a dozen. 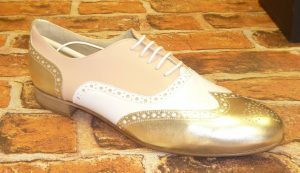 Tom was apprenticed to a Polish cordwainer and then set up his own shop Sole Healers in Chelsea. 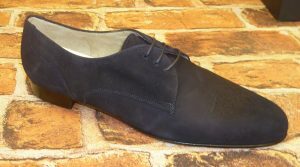 Today, he divides his time between designing and making his TOM KILGALLON shoes in his studio, and expertly repairing shoes next to the dry cleaners in Leonard’s shop in Chapel Market. He’s also found time to do a degree at Birkbeck College in History: Classical to Early Medieval. When I first met him, we used to have conversations about the Vikings in Constantinople and the Varangian Guard in the early 11th century, while he was re-heeling my shoes. 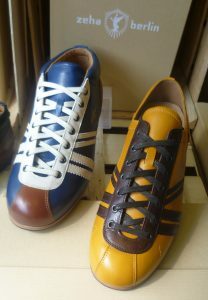 Here are a selection of his shoes; all in a limited edition of twelve. 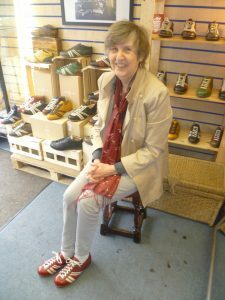 Florence, who owns a number of TOM KILGALLON shoes, assured me that they, too, are extremely comfortable. 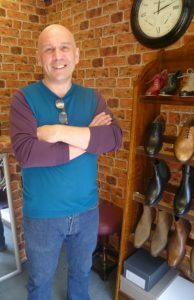 Tom told me that a number of customers have come in with shoes to be repaired and walked out wearing a new pair of his shoes. I can’t resist trying on a pair of the Zeha Berlin shoes myself. I’m in heaven! The next pop-up shop day is Sunday, May 7th, 9am-2pm. OMG! I wish you hadn’t posted this. 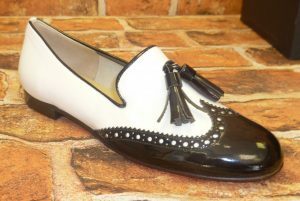 Now I’m gonna have to come up with £££ to satisfy my shoe lust which you have so expertly piqued! Thank you for your comment, Steve. 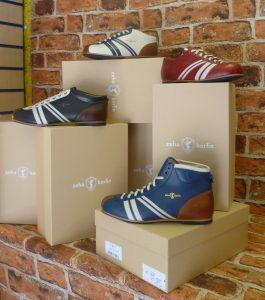 When I googled Zeha Berlin, I found some wonderful old photos of their trainers in the 1960s, together with the history of how they’ve updated them for the 21st century, which might appeal to you. Those look wonderfully comfortable. Bet they aren’t cheap, though! Thank you for your comment, Elizabeth. I gave you the prices in the post! They are more expensive than I’d usually pay but about £200 is not that exorbitant in the sum total of things, given that they are hand made, beautifully soft and comfortable, and will last forever. The stall holder said that he’d had his a year and they’d never needed repairing – and you can see from his photo that they’d had a lot of use! What a glorious post – it did make me smile. And of course I now long to own a pair of butter soft shoes, shoes which are ‘soft as mutton’ as the stall holder put it – lovely. I’m delighted you enjoyed it, Prem. Thank you for the lovely review. It’s always a pleasure to see you!